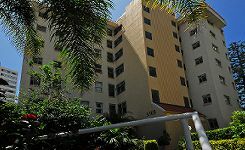 Just 50 metres from Surfers Paradise Beach, Kupari Boutique Apartments offer a private balcony and lovely ocean views. Kupari Apartments in Surfers Paradise features an outdoor pool and a barbecue area. Free parking is available on site. Guests enjoy 300MB of free WiFi per device per day. Each 1 & 2 bedroom modern apartment features a spacious open plan living area with a TV and DVD player. Laundry facilities and a kitchen with a dishwasher and microwave are standard in all apartments. Kupari Boutique Apartments are a short stroll to shops and restaurants, 10 minutes’ walk from Cavill Avenue, and 10 minutes’ drive from Jupiters Casino. Gold Coast Airport is a 30-minute drive away. The tour desk can book whale watching cruises and day trips to the Sunshine Coast. Surfers’ Paradise is a great choice for travellers interested in relaxation, theme parks and nightlife. Car rental and babysitting services are available upon request. Our Surfers Paradise apartments feature Ocean & Garden Views, sunny private balconies, fully self contained kitchens, unique decors, colour TV, direct dial telephone, FREE WiFi, security parking, pool, BBQ and so much more. Only 50 metres to the beach, quick walk to shops and restaurants and a 10 minute walk to Cavill Mall puts this accommodation property in a great location in Surfers Paradise. Public transport is just outside of reception for your convenience. Fully self contained, in a premiere location in Surfers Paradise, with easy access to everything Surfers Paradise and the Gold Coast offers are just some of the features of this affordable Surfers Paradise accommodation for any holiday traveller.